Any one who has ever had an aquarium can tell you that they know what Ich is. It is the plague of aquariums and tropical fish. AND our beloved koi and gold fish can become infested with it too. They are not as easily identified on Koi as they are on tropical fish. But a microscopic exam will reveal them readily. One good thing about Ich is that it clears easily with salt. It takes about 2 weeks of salt at .3 in order to be fully killed off. To the naked eye it will look like salt or sugar has been sprinkled on the fish. Ich is easiest to see on the fins. 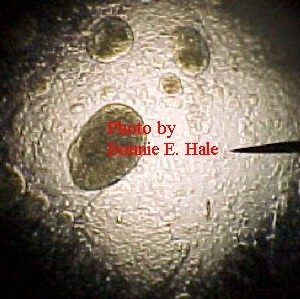 Under the microscope it is one of the easiest parasites to see. It may appear round or oval and will change shapes. Inside the black circle you will see a crescent shape "roughly "c" shaped with many black dots. These dots, if you watch them will spin around. I did try to capture the crescent shape in the camera, but after many attempts was not able to. Both pictures are "click able" to enlarge them to see the details. 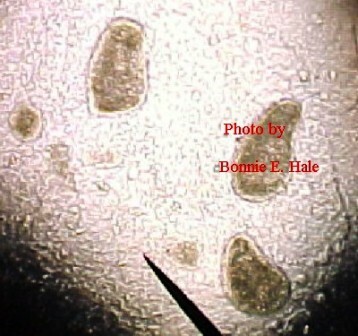 Top left is was taken on the microscope at 400x. There are 2 Ich right next to each other where my name goes through the photo. copyrighted designs, photos or other brand features, please contact me permission requests.